Healthy skepticism encourages us to check our assumptions, recognize the limitations of our methods, and proceed thoughtfully. Skepticism and controversy about “parental alienation” still remains an obstacle to resolving this family crisis in family court. Social science researchers and advocate have spend decades trying to get the concept and the language validated by mainstream health, science, and family law. It is time that we need to examine our own assumptions, limitations and proceed thoughtfully. When all efforts to get society, especially the mental health and legal professionals to recognize “parental alienation” as a legitimate crisis have failed, then the problem is not on “them;" it is on us. How can we expect "them" to adopt a concept when we ourselves don't even have a common definition? Regardless of the inherent controversy with the term “parental alienation”, it is short sighted to think that the mental health and legal professions are going to fully embrace a problem that doesn't have a clear, stable definition. Is it a dynamic? Is it a mental illness? Is it child abuse? No one, outside of our elite little PA community is going to take us seriously until we resolve the confusion about what “parental alienation” is by explaining it simply in language they already know. A year ago, a member of the Parental Alienation Study Group (PASG), proposed a far-reaching position statement to its members for adoption. The position statement strongly supported using more widely accepted and less controversial language. The position statement recognized that the failure with "parental alienation" was more about the words than it was about the actual dysfunctional family. Adopting this position statement (or an amended version) could have brought this international group of authors and researches in line with the largest, most powerful organizations and agencies in the United States who are working to change the outcomes for families struggling with narcissistic/borderline abuse. PASG could then network with established change agents such as; Adverse Childhood Experiences, trauma informed health and legal workers, Child Protective Services, domestic violence advocates, the National Education Association, the APA, and a plethora of others, all fighting to stop this type of horrific interpersonal trauma by a narcissistic/borderline parent. The biggest problem with shifting the paradigm of "parental alienation" is is that many of us are so traumatized that we can't differentiate relevant from irrelevant information. We understand and use these words so much that they have become relevant to us-- but only us. We need to be able to communicate with the rest of our country, but we don’t have to throw the baby out with the bathwater! Simply put, “parental alienation” is not the whole enchilada, but a set of abusive strategies (or a pattern of abusive behaviors) that a narcissistic/borderline parent uses to devalue and discard the other parent from the family. This is a subtle but significant difference. The abusive acts of a narcissistic/borderline parent abusive cannot be separated from the abuser's personality disorder or their reenactment of childhood trauma. The average parent doesn't all of the sudden become a masterful psychological manipulator and exploiter with no empathy who wants to destroy the other "targeted" parent. 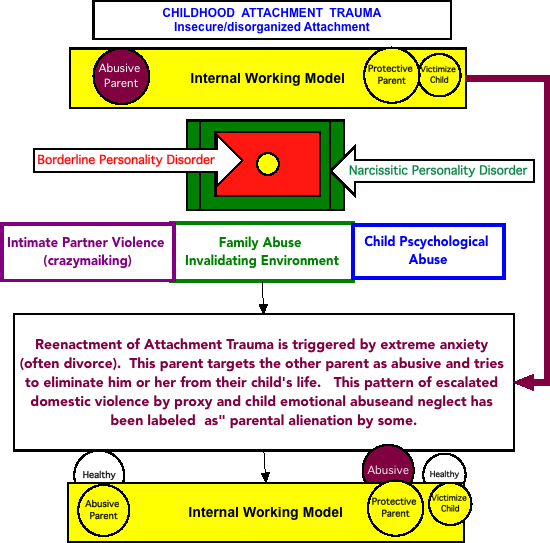 Below is a diagram of the chronology of how attachment trauma impacts the development of narcissistic/borderline personality disorder and how that disorder plays out in family situations. The hallmark of these parents is that they are psychologically abusive to every member of their family and close friends. They also like to escalate conflict. Many of these families breakdown under this unrelenting stress. Narcissistic/borderline parents internalize separation and/or divorce as acute abandonment. This stress triggers them to reenact their childhood trauma based which is based on their distorted and disorganized memories stored in a part of the brain's attachment system called the internal working model. In this reenactment, the abuser casts the targeted parent in the role of the abuser and he or she takes on the persona of the healthy or protective parent. Reenactment never ends for the disturbed parent. He or she will always see the targeted parent as the abusive parent and engage in and escalate psychological (emotional and verbal) abusive strategies such as triangulating the child into the a cross-generational coalition against the targeted parent. The sooner we stop calling post separation domestic violence and child psychological abuse “parental alienation”, the sooner we can engage in meaningful and effective intervention and prevention in a systemic and comprehensive public health plan.